In June of last year, I suffered a life changing back injury in an ATV roll over accident (later diagnosed as an L-2 Burst Fracture with lateral translation). Paramedics rushed me to Western Medical Center in Santa Ana, where an orthopedic surgeon told me my injury was so complex he did not even know where to begin. He stated I would likely require 3-4 surgeries over the course of several months, and the odds of me ever walking again were extremely low. Fortunately a couple friends of mine were present, both of whom work locally as emergency room medical doctors, and they independently began calling on all of their contacts to determine where I could go to get the absolute best care for this specific injury. After several calls and text messages to their colleagues in the area, the response was clear. I needed to be taken to the Neurosurgery Unit at UCI, specifically to be seen by Dr. Daniel S. Yanni. I would like to start with a little background…unfortunately I have had my share of medical challenges: 14 knee surgeries (TKR on one), over 50% of my colon removed, both shoulders have been reworked, double hernia surgery and a few fainting spells just to name a few. With that said I have had my fair share of doctor relations. Mostly fair to good, but without a doubt Dr. Yanni has been the first to inspire me to take such a pause in my daily routine to write a review in this fashion. Without going into my personal drama anymore than I already have just know I went into the ER complaining of right leg pain and was losing the ability to lift my leg more than a few inches off the ground. MRI found a mass on my lumbar spine that needed to be removed. Freaked with the news (given to me by the ER doctor who said I needed to talk to the surgeon) I sat there, with my wife, wondering how can this be (really more like…not another surgery for crying out loud). I don’t know how I can explain what happened next: Dr. Yanni walked into my room and everything seemed to slow down (in a good way…mind racing and all) and this feeling of confidence exuded from Dr. Yanni devoid of any arrogance! He very simply explained my situation and informed me how he could help. Nothing pushy, black or white…just calmly breaking down the situation and then giving me my options. Without being forced or coerced in anyway, his calming good nature and somewhat demiurge character made me feel relaxed and at ease with my predicament. Without being rushed Dr. Yanni sat there with my wife and I giving us the attention we needed to be informed and prepared for such a decision. In the end, thinking back, it was Dr. Yanni’s poetic stature and his soft spoken demeanor mixed in with his unyielding confidence that had me from the very start. Well informed and feeling like this doctor could do no wrong I am so pleased to announce that I put my spine and future in Dr. Yanni’ gifted hands. Just hours after my surgery my leg had regained its freedom and was eager to have me up on my feet walking on my own the very next day. Jumping ahead to my first post surgery appointment, sitting in the front lobby, I overheard Dr. Yanni talking with his receptionist outside of view…just hearing his voice brought me back to that peaceful place again pondering how impactful one doctor could be with this 49 year old skeptic. Forever grateful our paths crossed when they did…I stand today grateful and blessed for the wonders of Dr. Yanni! I would and have recommended Dr Yanni to my family and friends. I have had two surgeries by Dr Yanni, (stenosis and L5-S1 fusion) and it went just as expected. Frankly, I feel wonderful with no lower back pain any longer. I have been seeing Dr. Yanni for over 2 years for a Degenerative Disc problem on L4-L5. I have been having this issue and the leg pains that go with it for 6 years and it finally came to the point that I needed the Fusion Surgery. Dr. Yanni performed this on me in Nov, 2017 and so far so good. I see him monthly with current x-rays to verify that all the screws are still in place and that I have not done anything too strenuous to disrupt my situation since I have very bad bone density. Because Dr. Yanni is possibly the best Neurosurgeon in Orange County (that’s no small statement), my right lower leg function has returned after L4-L5 fusion surgery last year by an excellent Surgeon who did my laminectomy and L5-L6 fusion in 2006. When I finally showed up on Dr. Yanni’s doorstep, my right gastrocnemius would barely lift an unpinned set of plates on a muscle-specific weight lifting machine and I wore a brace. After Dr. Yanni, no more leg brace and I am already lifting 70 pounds consistently (healthy left gastrocnemius runs 85 pound lifts ‘all day’). I’ve been a runner and body builder all my adult life, this Surgeon is a Six Star professional. I needed 3 cervical fusions. Dr. Yanni got me in to surgery as soon as possible and results were immediate. He explains everything about the procedure and outcome very clearly and encourages you to ask questions. His staff is very friendly and considerate. I cannot say enough good things. As a health care provider myself, I know a good doctor when I am a patient. Dr. Yanni is a great doctor who is very skillful in his profession. If you need a spinal operation, Dr. Yanni is the best. Dr. Yanni is an excellent practitioner. 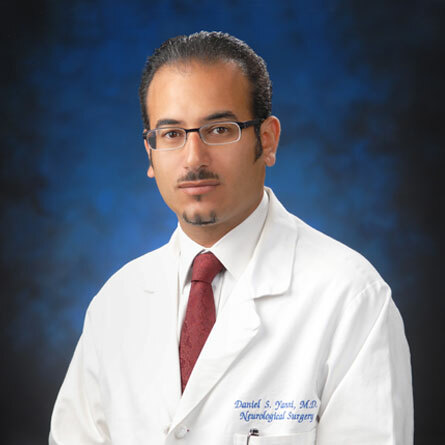 You truly couldn’t ask for a better physician for treatment of spine conditions. The work he has done outside of my own personal experience is exemplary. As a medical practitioner working in healthcare I cannot offer a higher endorsement of a physician. In addition to being an expert in his field, Dr. Yanni is compassionate, caring and highly professional. I would recommend him and his office to my family and friends without hesitation. Dr. Yanni performed my spinal surgery (2 level fusion) in April 2018 and I could not be happier with the results! From the moment I awoke after surgery, the sharp shooting pain in my glute has been gone and with every passing day, my low back pain is less and less. I’m no longer in constant pain, which is a blessing after living with chronic pain for 2+ years. The office staff is AMAZING and super helpful with all the appointments, rescheduling, follow-ups, etc. — always friendly and happy to go above and beyond to help!! Love this entire office and highly recommend seeing Dr. Yanni if you are considering spinal surgery!! Dr. Yanni has performed 2 back fusion surgeries on me, L234&5 and I am completely free of any and all pain. My life is back to normal, I golf 3 times a week, can walk, stand and lift heavy objects, which prior to the surgeries was not able to do any of them. Yesterday, 8/29/18, I visited him with a new problem that has bothered me for 6 months. He found the problem, gave me a shot and I was able to sleep and awoke with no pain. Tremendous Doctor, wonderful human being, love him for what he does. Dr Daniel Yanni is just so amazing it is hard to put it into words. He is not only about the money like other Drs are. He is more about you and how you feel. From before to after your surgery. His knowledge is amazing and he is fully up to date with the latest techniques and procedures! He is also very knowledgeable about EDS which is very impressive to me because I have it. Most surgeons barely know about is. Dr Yanni already knew. He has a great bedside manner as well. My decision for who would perform my second spinal fusion surgery came down to factors such as Accessibility, Approachability, Credentials, and Above and Beyond Attitude. Dr. Yanni and his staff have all of these in spades. I would strongly recommend Dr. Yanni to anyone in need of a neurosurgeon. God willing I will never have need of his services again but if I do there is no doubt that he will be my first and only call. God bless you and prayers for your speedy recovery (Isaiah 41:10). My Husband and I have a Continuing Education Service for doctors. 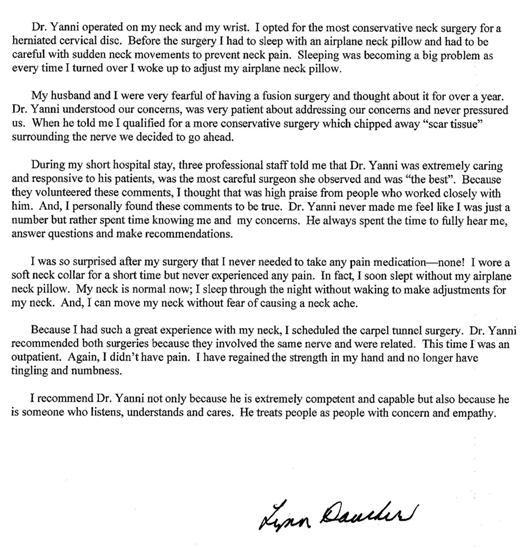 Dr. Yanni has taught for us for several years and the doctors are always impressed with his knowledge, expertise and ability to talk to them in a format that they understand. He is a great listener, makes each person feel important and explain all possible options of treating the patients symptoms/diagnosis. Dr. Yanni treats his patients like family and has a sense of humor to help them through their medical care. Dr. Brian J. Porteous and Laurie Porteous, R.N. My mom has had severe lower back pain off and on for a few years (it flares up then gets slightly better but has never gone completely away). I was concerned she was not getting top care with Kaiser and contacted Dr. Yanni for an out of network image review. I’m so happy that I did. Dr. Yanni was extremely thorough when reviewing and discussing my mom’s MRI and diagnosis. He took more time than other surgeons to make sure every detail of the surgery he recommends was explained. His professionalism and kindness are amazing. Thank you, Dr. Yanni! My husband had a cervical fusion procedure done to his neck. He fought against doing this procedure because of a past experience and about things he had heard. He put it off for about a year because of his fear. Finally because of his trust in Dr Yanni, he went ahead and had it done. Dr. Yanni put him at ease by completely explaining the procedure in understandable terms and his excellent bedside manner. During the whole experience from start to finish, Dr. Yanni was professional and sensitive to my husbands fears and gave us a sense of trust in his ability. The surgery was a success and my husband was sorry he waited so long but was glad he finally found a surgeon he could have faith with. I am currently a Kaiser patient. I have been experiencing extreme back pain for months and the issue has not been resolved. Dr. Yanni did an out of network image review for me. He was so thorough and took the time to explain the procedure I need in great detail. He was never rushed and was extremely kind and professional. Thank you, Dr. Yanni!